Please call us on 020 7620 1020! As expert joiners in London, we specialise in bespoke fitted wardrobes, made to measure to fit your home perfectly. We start by offering a design appointment, consulting with you to make sure your new wardrobe is everything you want it to be. Our team then make your wardrobe in our own London-based workshop. Select the style, colour, internal storage layout, door type… the options are almost endless. We make all wardrobes to size and only use infill panels to give a neat finish. As creators of beautiful bespoke furniture and custom-made wardrobes, we can design and build anything you need for your home. Whether you know exactly what you want or you need a little guidance, we can help, making sure your home is both practical and beautiful. Our fitted furniture ranges from bespoke shelving and bookcases, to under-stair storage and alcove furniture to make use of all those awkward spaces. Whatever you need, our team can advise you further. Floating and built-in shelving, made to fit around your space. We can design and build your entire kitchen from scratch or work with existing designs you may already have. A bespoke design will lend a premium look to your kitchen, and because it is made to measure, it will be perfect for the space you have. This is the ideal way to build in as much storage as possible while making sure everything is neat, tidy and, of course, beautiful. Why do our customers choose us to craft their bespoke furniture? There are no oversized infill panels; materials are cut to size for the perfect fit. We design, fit and project manage, keeping you fully informed along the way. Your furniture will be made for your home and completely personalised. We can visit you during evenings or another time that works well for you. Lead times are usually just 4-6 weeks and furniture is fitted by expert installers. Learn how we can transform the different rooms of your home and how we can create beautiful tailored furniture to meet your needs. Outstanding Work! We are so pleased with every aspect of the design and finish. We wanted the frame to match the flooring – they couldn’t have been any closer a match. Living in a Victorian house brings it’s challenging in terms of walls not being straight but the guys dealt with this seamlessly and the cupboards/shelves sit beautifully in their space. Thanks again! Request your quotation from us. 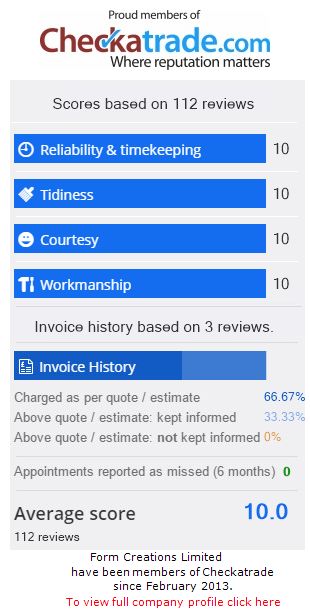 Fill in as many details as you can, and if we have enough information straight away then we will send you an estimate. Our simple quote request form is designed to help you tell us what you are looking for and it only takes a couple of minutes to complete. If you have approximate dimensions of the space available, then why not use our wardrobe estimator to select your preferred internal colour and layout, and external door styles, then we can get back to you with a more accurate quote. Start the process – get your personalised fitted wardrobe estimate. We’re here to answer your questions and advise on the perfect bespoke furniture options for you and your home. We are a joinery company in London offering unique built-in wardrobes and beautiful furniture for the whole home. Ask us for a design and free quote.